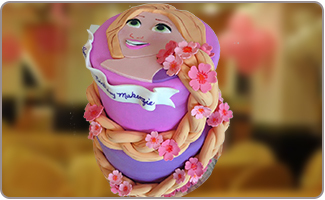 The movie Tangled has quickly become a favorite among girls, making a Tangled birthday party a popular choice for many children. 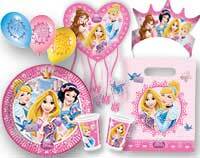 If you are running out of ideas for hosting a tangled birthday party ideas in India, here you can find easy ideas and theme supplies for a great celebration. You will have to choose between an indoor and outdoor party; make sure to check the weather ahead of time and have a backup plan for an outdoor party. A hair salon would be a perfect location for a Tangled themed party! Have all the girls get their hair done; call for party packages. If you don't want to pay the salon fees, consider having a hair party at home; get some fun hair accessories and brushes for the girls to do each other's hair. Watch the movie for some ideas for planning the party, and ask your child what their favorite parts are. 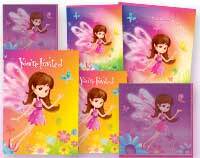 Pre-packaged Tangled birthday party invitations make it simple to take care of inviting friends. Choose from the many Tangled images online to make your own Tangled birthday party invitation and print it out. Use yellow construction paper cut into long waves to imitate Rapunzel's long blonde hair. Write the party information down the locks. Make sure to note whether or not the party is a slumber party so guests will know to pack an overnight bag. 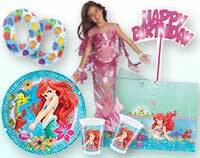 Use an online service to send out electronic Tangled birthday party invitations and skip the paper. 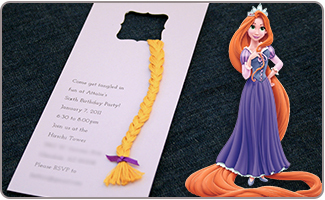 Another exciting invitation can be, a tower invitation with a cute window cut out and a long blonde braid of rapunzel coming down. Make the braid using a golden yellow, embroidery thread as shown in the picture. Play a game of pin the hair on Rapunzel using a poster from the movie and a long piece of pretend hair made of yarn. 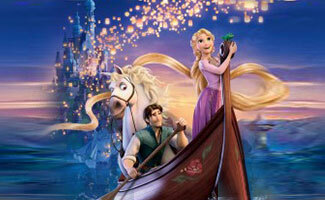 Hang a heavy rope from something very sturdy – tie it carefully – and call it Rapunzel's hair. Have a contest to see who can climb the highest. Purchase hair extensions from a beauty supply. 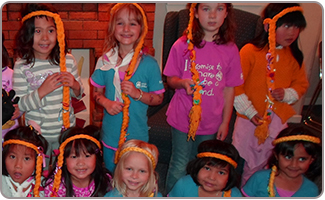 Line them up and have a race to see who can braid Rapunzel's hair the fastest. Using construction paper and an LED tea light, have each child create their own lantern like the ones released into the sky in Tangled. Print out "wanted" posters like those for Tangled's hero Flynn Rider. Let your guests draw their own face in the wanted space. Let each child take home one of the lovely lanterns lit from within with an electric tea light. 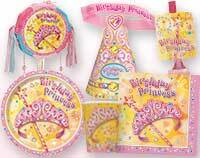 Create a great goodie bag of treats from our selection of Tangled birthday party supplies. Hand out tiaras for all the little princesses, and a clip-on hair extension to play being Rapunzel. Grab the cast iron skillet and fry up some chicken or other yummy treats – the skillet is Rapunzel's weapon of choice in the movie. Make angel hair pasta to match Rapunzel's long hair. 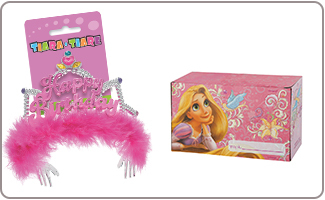 Create the perfect Tangled birthday cake with our easy to use cake toppers. 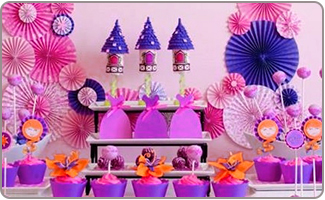 Decorate cupcakes with candy flower petals to look like the magic flower in the Tangled movie. Serve up a spread fit for a princess with tiny finger sandwiches and dainty desserts, and a lovely tea to go with them. Hang lanterns from the ceiling similar to the ones in the movie that are released into the sky. Light them with tea lights that are electronic for safety. Use a variety of colorful balloons in your child's favorite colors, as well as streamers. 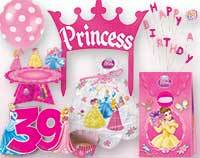 Select from our wonderful options for Tangled birthday party decorations that are ready to use. Create a pretend window high up on the wall with a long blonde ponytail hanging from it (use yarn for the hair). Decorate with silk flowers like the magical flower from Tangled scattered around the room. 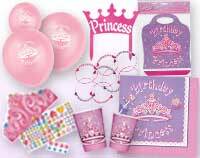 Classic princess themed décor such as tiaras and wands work well for this theme also.